The end-of-year return home wouldn't be complete without a trip to the village of Saltwood for a romp across the British countryside in the annual Saltwood Boxing Day Run, now in its 39th year. The weather for our trip home has been absolutely diabolical, but one would expect no less. After all, a British man never leaves home without his umbrella - or so my Chinese students used to tell me way back when. Wait, what? But, yeah, it's rained every day since we've been here and, much like last winter, rivers are bursting their banks and half the country is under water. I lived through this misery for the first 20 years of my life, but now the annual return to the UK makes me thankful for every single one of those 300 days of sunshine we are reputed to get on the Front Range of the Colorado Rockies. That said, nothing quite beats the British countryside on a glorious summer day, no mater how few and far between they are. But I digress. 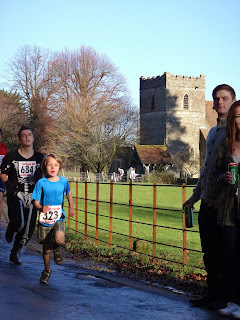 All you need to know is that the route for the 39th running of the Boxing Day Run was bloody muddy. The race, nay run, is an approximately three mile loop through farmers' fields, past a gate or two, over a stile, through the woods, up and down a couple of hills and back to the finish line on the village green. A true cross country race in a quintessentially British setting. This would be my sixth running of the race in the last seven years. There looked to be a good turnout milling around as we got ready for the off, runners no doubt encouraged by the brief window of sunshine we were enjoying following the previous two days of torrential rains and gale force winds. After a few pleasantries on the start line with a couple of the Saltwood regulars it was down to business. The start was hectic and I came close to taking an early digger with ankles being clipped left and right by overanxious youngsters getting out at a sprint. By the first turn I finally had room to run and found myself sitting somewhere around tenth with a couple of lads off the front that I knew wouldn't be coming back. 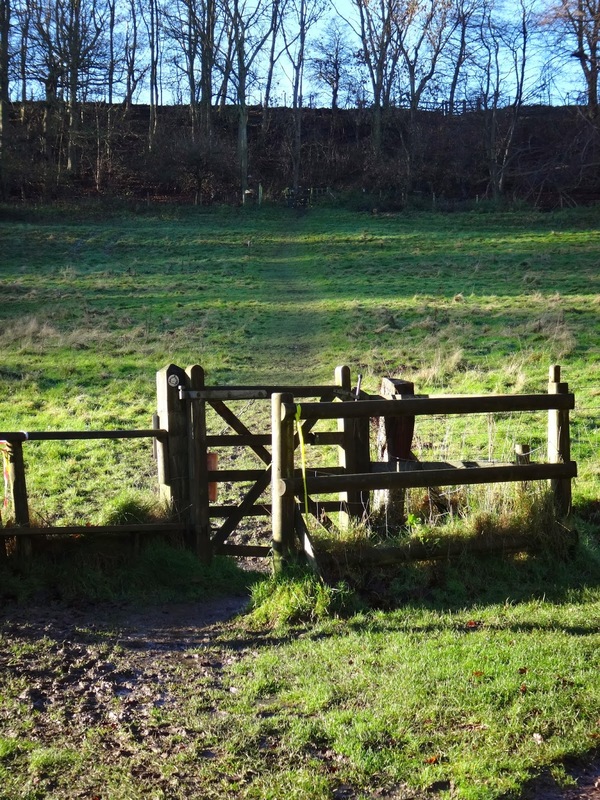 The lead up to the first kissing gate, coming up from the first river crossing. Across the playing field, I passed a couple of the early pacesetters before easing past a few more on the slick descent to the first footbridge. 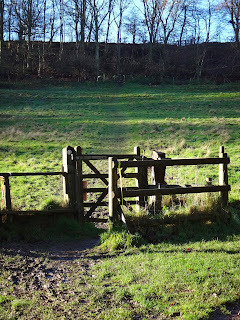 Up the steps to the 'kissing gate' I was sixth in line, a position I held up the first hill and over the stile. Across the grazing field - no sheep this year - I moved into fourth, with third 10-15 meters ahead and first and second off to the races. A mile down and it was a race for third. I had my brother's cross country spikes on this year and they made a huge difference versus regular trail runners, which are simply no match for the bogs of the Saltwood course. On the slick boggy paths under the wooded canopy, I went to work on bridging the gap to third making a bit of a dent by the time we popped back out into the fields. I was close enough now that I could hear some pretty labored breathing and was feeling strong enough that I was able to keep firmly on the gas up through the rolling paths, a number of which were more brook than trail. With a half mile to go on the final footpath leading back down into the village I began closing quickly and ultimately went by without a fight, finishing back on the green in a surprising four second PR and third place overall. Five-time winner Michael Coleman was finally dethroned by a young lad, Maximilian Nicholls, who has been running the race for years, coming of age this year with an impressive slog through the mud. Happy to get on the podium again. After getting a few layers on, I headed back out to watch Alistair finish up what he fittingly refers to as the Mud Run. Just the two Clarks on the start line this year, but hopefully we'll have a full contingent next year for the 40th running of this great running tradition. Finishing it up and putting the hurt on Skeleton Man. Please tell me Alistair swipped that dude's beer! Carslberg? Nah, he knows better. Sorry, but you've just lost the Game!